Brue lives with and is adored by Helen & Troy in Perth's south-east. Brue is another promising male we kept from Bae's Litter to Moloscyg Ostentatious. He was different in terms of type when assessed alongside his litter mates, but he retained some strong breed characteristics and direction for the future of our kennel and the breed. Brue is loved, trained, conditioned and spoilt by Helen & Troy. He makes a few appearances in the show ring with mummy Helen throughout the year and will continue to be campaigned throughout 2017. As Brue is maturing, we are excited to see his strong type develop. 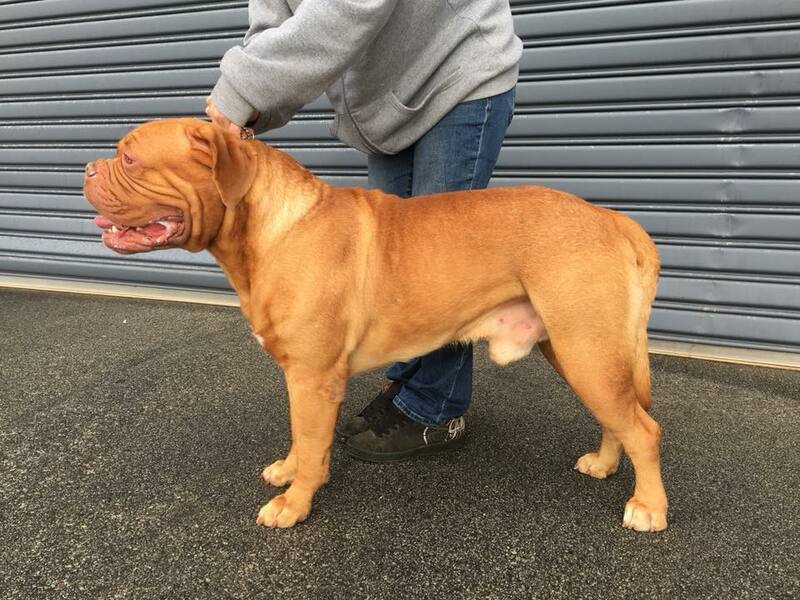 He has wonderfully dark eye colour, often lacking in the breed, he is well proportioned with depth of chest, spring of rib, short straight hocks, correct feet, a strong thick neck, correct undershot bite, correct length of nose (1/3 the total length of head). He would however benefit from more forehead, width of jaw and boning, but we are happy with how Brue is progressing and he will only get better with age. At his first show, Hills Kennel Club on 2 July 2016, Brue was awarded 1st in Baby Dog class against brother Diablo in the Open show (judged by H Jones) and 2nd in Baby Dog class in the Championship Show (judged by Mrs A Pozerski). Mummy Helen did a fine job for her first time in the ring. His second show, at Utility Dog Club's Championship show on 10th September 2016 and judged by Mrs S Lazic from Serbia, Brue was awarded Challenge Dog & then Best Minor Of Breed. Thanks to our friend AJ for handling him. The Perth Royal 2016, was a blast. Brue enjoyed himself once he had settled in and became comfortable with the crowds. In the end he was literally throwing himself at peoples feet for a belly rub, and pushed himself beyond his normal nap time for more. He did well in the ring, handled well by mummy Helen and was awarded Reserve Challenge Dog & Best Puppy of Breed. Saturday 25th February 2017, at the Hills Kennel Club Champ Show, Brue was awarded Reserve Challenge Dog & Best Junior Of Breed under Victorian judge Mrs K Smith. Handled again by mummy Helen, she did a great job, more practice but you both will get there, Rome wasn't built in a day. The 2017 Western Classic is one of the biggest shows on the WA Calendar, and this year we had the absolute pleasure of having one of the most well known judges and breed enthusiasts, Senor Rafael Alcrudo from Spain as our judge. Brue is maturing nicely and was awarded Dog Challenge & Runner Up To Best OF Breed (our very Oona). He also got a good look in for Junior In Group (which was awarded to a very nice Doberman). Still having a few hiccups with mouth inspection but patience and persistence is key and we are confident Brue & Helen are on the right path for a wonderful future. They make a great team.